In this jazz piano video lesson we look at how to practice the exercises we've learned so far through other chord cycles. You should be able to play and attempt to sing all ii-V's, minor and major triad embellishments through these cycles before continuing to Exercise #6. This cycle is essentially the opposite of the circle of 4ths. Try to think of the circle as a clock. If you move clockwise you go around the circle of 5ths. If you move counterclockwise you go around the circle of 4ths. This one is fairly intuitive. You either ascend or descend through key centers in half steps until you reach all 12 keys. You can think of the key centers in these groups as belonging to three diminished seventh chords. 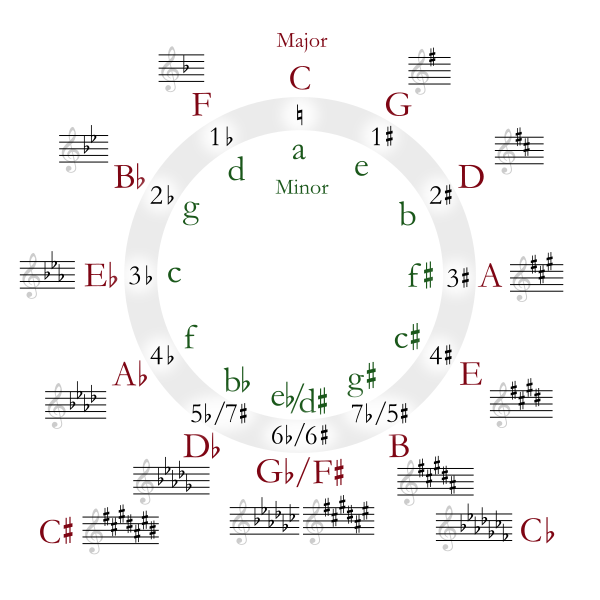 Either write out a group of random key centers or choose them at will while sitting at your instrument. All of these techniques are demonstrated in the jazz piano lesson below. Keep in mind, these exercises are not exclusive to jazz pianists. All instrumentalists, even advanced ones, can reap the benefits of singing and playing through these improvisation exercises. Remember to sing accurately and slowly through all keys. Rushing through each exercise will only add frustration when you are trying apply these concepts later on. A preview of the the 10-part .pdf download can be viewed here: Chord Tone Improvisation Part 1: Chromatic Embelishments (via Scribd.com). A download is available be clicking the "Add to Cart" button under the top right hand sidebar.